National Architectural Competition for the development of a residential, recreational and cultural complex. Creating a friendly habitat that is accessible to the low middle class in Venezuela’s capital is a difficult task given high current construction costs and deteriorating salaries. This presents a challenge in creating a complex that is interesting from an urban viewpoint, with attractive housing, but where rationality in conceiving the new place and the housing unit play a key role. Thus aesthetic sensitivity and the logic in creating the complex must operate in parallel. The decision to create a band that weaves through the terrain increases the perimeter of the housing space; this folding allows all of the housing units to have a good view, without incurring into the space of other housing. Instead, all of the environments within each housing unit have views that enrich daily life. The so-called superblocks have an efficiency advantage because they make rational use of areas for circulation, good ventilation and lighting, and a flowing surrounding space. However, this type usually does not allow for configuration of attractive, open community spaces but instead leaves residual spaces. In contrast, the perimeter block with patio can generate high-quality confined spaces but these come at the price of isolation and fragmentation of the common spaces’ autonomy, which often damages the unity of the complex. The proposed solution is complex because it tries to take advantage of both types of construction. 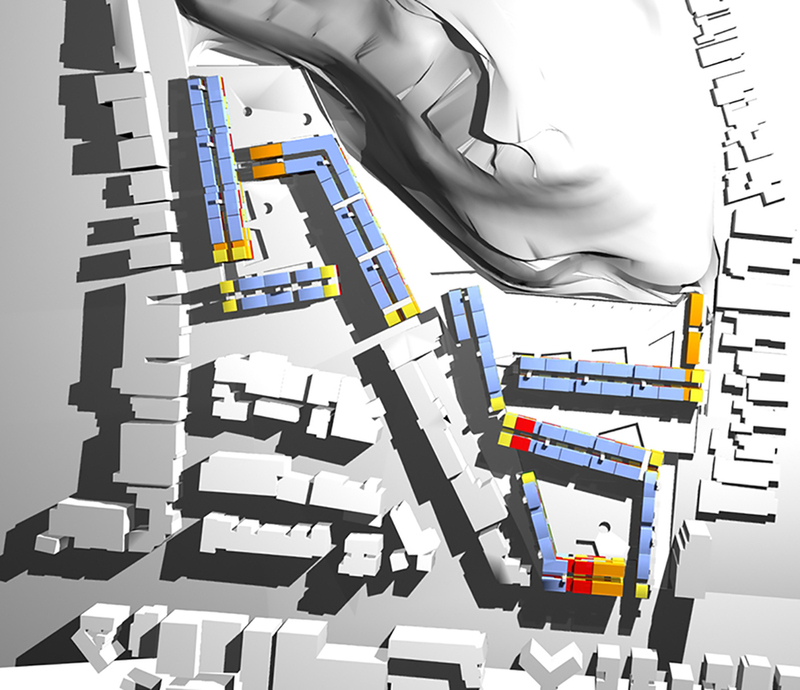 Very large and efficient buildings whose environments all enjoy a good view, maintaining spatial fluidity, are proposed: however, at the same time confined small plazas are created that allow a feeling of ownership by residents of the surrounding buildings, without giving up the spatial continuity of the whole. This proposal achieves housing with patios and, simultaneously, an integrated complex. The proposed system has very attractive corridors, enlivened by fold-out stairways that breach the space between two layers and allow access to the apartments without having to resort to traditional and unattractive hallways passing directly in front of the housing units. Open spaces are also provided to accommodate elevators in case they are required in the future.